The Spider Camera Holster is a new way to carry your camera. With this system your camera will clip onto a belt, taking the weight off from your neck and shoulders. Personally, I dislike standard camera straps. So I was thrilled to have the opportunity to test out the Spider Holster. I tested out the SpiderPro Single Camera System, which includes the SpiderPro Belt, the SpiderPro Holster, the SpiderPro Plate, and a SpiderPin, with a Canon 7D with battery grip, a 70-200 f4 IS, and 430EX II Speedlite. The SpiderPro Belt with Holster was very easy to adjust and get situated on my waist. The belt is adjustable via a velcro strap and is easy to switch the position from the right side of your body to the left side. 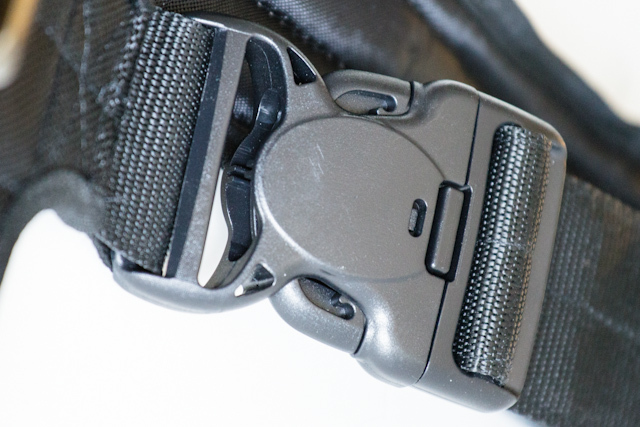 The buckle is a triple lock type so you know that it will not randomly come unclipped. Attaching the SpiderPro Plate and SpiderPin to my camera was simple. You line up the plate screw with your tripod socket, use the included hex wrench to tighten and you are done. 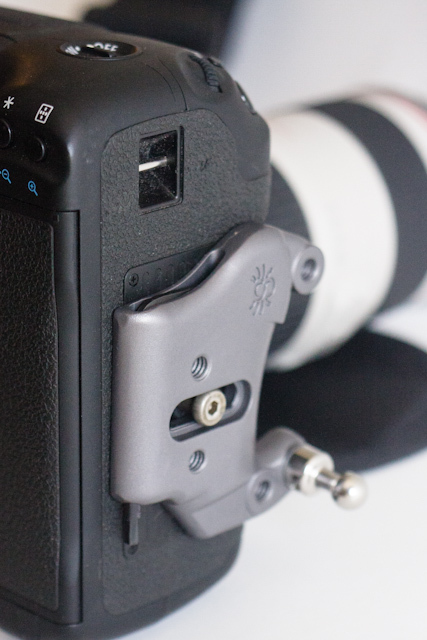 With this plate you can still attach a tripod quick release for tripod use. With the setup above, I found it very comfortable to move around, bend over, and squat down. I never felt that my camera was out of control (no worries about the camera swinging out to bonk someone on their head). It was always secure in the holster with very little movement on the pad. Depending on your needs, the holster has a two-position lock. 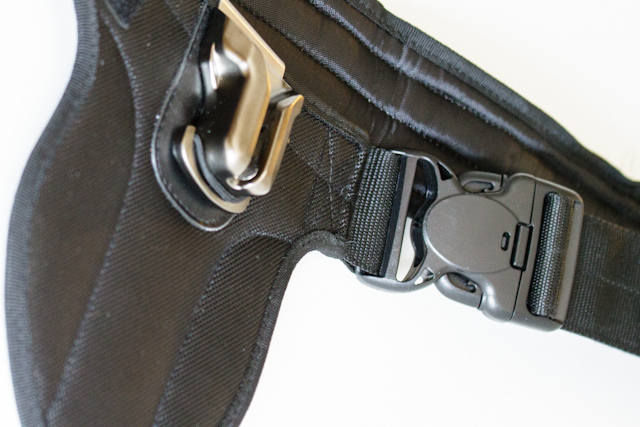 The lower position secures your camera in the holster each time you put it in. This lock is useful when you are moving between locations and want to guarantee that your camera stays where you put it. The second position is the upper position, this disengages the lock for fast access to your camera. This is extremely useful when you need to make a quick adjustment to a subject or want to demonstrate a pose to a client/model. Can still use tripod with the SpiderPro Plate attached to your camera. The SpiderPro system is great for photographers who like/need to move around like wedding, location, and sports photographers. If you are a primarily a studio shooter, I don’t see this system as a great benefit. Overall, I found the Spider Camera Holster very comfortable and easy to use. I can see myself using this system for many of my upcoming sessions. You can learn more about the SpiderPro Single Camera System and other Spider Holster products on Spider Holster’s website. After a recent hicking session using my sling strap, this looks like a much better accessory for that type of outing. Would be nice to have a lens holster on the other side if you would like to have a lens option along. Thank you for the comment–Spider is working hard on a bundle of accessories that would attach/detach quickly from either Spider belts or a user belt as needed. Please register on spiderholster.com (contact tab) for any Spider news!.. Am I the only one who thinks camera holsters look absolutely ridiculous? I have tried a number of systems designed to get the camera off my neck. I have been using the Spider Holster for over a year, up hills in Europe and running around race tracks trying to get that perfect shot. It is the best product I have found so far. Other than being a very satisfied customer, I have NO link with the company. I’ve used this product for 2 years (since learning about it through popular wedding photog David Beackstead). I’ve loved using it because I’m not a fan of having a camera strap around my shoulder/neck all day when doing a paid shoot. It’s similar to using a tool belt. I find it to be a bit heavy on my waist when I have a 70-200/2.8 on a body … but it would be heavy around my neck/shoulder as well. Overall a great alternative to the traditional strap. I have been using the Spider Holster for a couple of years. It has worked well for me. Having said that, there were a couple of things that happened that I should caution users to. I was carrying on my hip my 1D Mark IV with a 70-200 lens and had my 580 flash attached moving from location to location when on a few occasions my flash dropped to the floor (broke 3 times). The other thing that happened was when carrying the camera with my 16-35 lens, the spindle unscrewed from the plate and my camera and lens fell to the concrete floor (lens broke). I still continue to use the holster but I check the spindle before attaching and I don’t put my flash on my camera until I need it. I also recommend it to photographers that want to ease the strain on the shoulders. Thank you for using Spider in spite of the issues mentioned. Just to inform the rest, we are now wrenching the SpiderPro Pin onto the plate in the factory–making sure they do/will not come unscrewed. We are developing a newer Pro plate version with anti-twist Pins as well.. If you are not yet–please do register with us at spiderholster.com (contact tab) for the latest Spider additions. We will launch quite a few new item this year and will annopunce as they launch. Feel free to email us anytime for feedback. Nice review Kourtney! My concern with something like this is that it seems like it would be really hard to move around quickly. I use a Black Rabid strap that I like, but it is hard to move quickly. This one leaves you with plenty of room to move? My main setup is a 7D and a 28-300L Canon lens, which is heavy. I do sometimes use the 70-200 II. I’m a Youth Sports Photographer and this seems like a pretty good option, especially with young kids and the need to adjust their poses a lot. I’m probably going to check this out, it looks pretty solid. Thanks. I also normally use a Black Rapid strap and found that I could move around easier with the Spider Holster. With my Black Rapid strap, I will accidentally switch my camera mode when the camera bumps against me, which is really frustrating. I have had no issues like that with the Spider Holster. As for weight, I had a 70-200 f4 IS attached to my 7D, which is lighter than the 28-300 or 70-200 II. I’m not sure how the extra weight would affect it. Bought Spider Pro 1 camera belt 2 months ago. I do not know what the material use Spider for belt under lock,but I break it for 3 pieces first day. I think they use plastic inside. I will send back after wedding season. David Beckstead use double camera belt, he use 2 years, I talked last week about it, seem that belts material was other. Actually Spider best belt, for my back,but terrible if you changing lenses,and want use tripod. Plate I recompose myself ,made longer.